Each year, Australian financial services (AFS) licensees must lodge with ASIC their profit and loss statement and balance sheet (together with form FS70) and audit report (together with form FS71). not a body corporate within 2 months after the end of its financial year – the financial year of an AFS licensee who is not a body corporate must end on 30 June. This means an AFS licensee who is not a body corporate must lodge by 31 August. a body corporate that is a disclosing entity within 3 months after the end of its financial year – for example, if the financial year ends on 30 June, an AFS licensee which is a disclosing entity must lodge by 30 September. a body corporate that is not a disclosing entity within 4 months after the end of its financial year – For example, if the financial year ends on 30 June, an AFS licensee which is not a disclosing entity must lodge by 31 October. Section 990B of the Corporations Act relates to auditor appointment for natural persons, partnerships, non-corporate trustees and proprietary companies which hold an AFS licence. a person or persons and firm or firms. Within 14 days after appointing the auditor, the financial services licensee is required to lodge a written notice together with the lodgement fee. Once appointed, an auditor will generally continue to hold office until they resign or are removed by the financial services licensee. 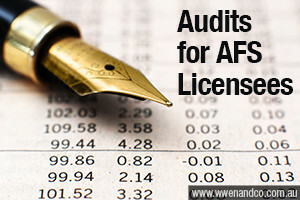 Call the City office of W Wen and Co to make your appointment with our ASIC registered auditor to help you comply with the requirements for AFS licensees.